Please, fix a home bar on iPhone X’s which refuses to hide from time to time. Зачем рекламировать как бесплатное если оно платное ??? I used to use Bookmate for several years, but cancelling my subscription now. The reason is the number of books available dropped drastically. I don’t know what the reason is. Probably they want to burst audiobooks subscriptions, at least for many books I want to read, they suggest an audio edition. You waste your money on subscription if you want to read. After my complain about the 7.2 version, customer service replied immediately and they released two more updates in a matter of 3 days. The App is now working swiftly and I am a happy reader once again. I love BookMate because I can find books in different languages and I can also upload my own. 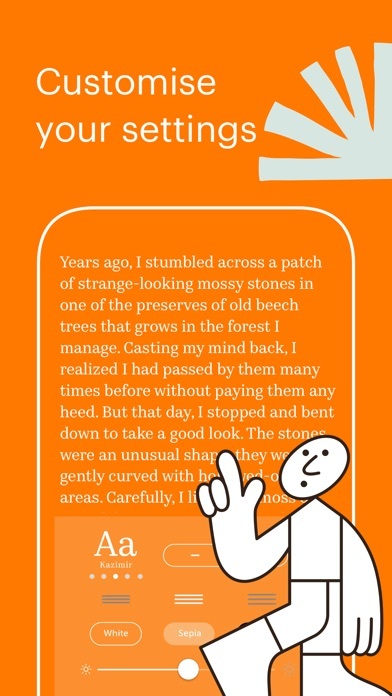 I enjoy using this app for reading. After the last update two days ago my application fails to open. Nice, but why there is no rating system in the app. That would good to have a list of best books based on readers ratings and feedbacks. Or something like fresh/rotten system on rottentomatos. 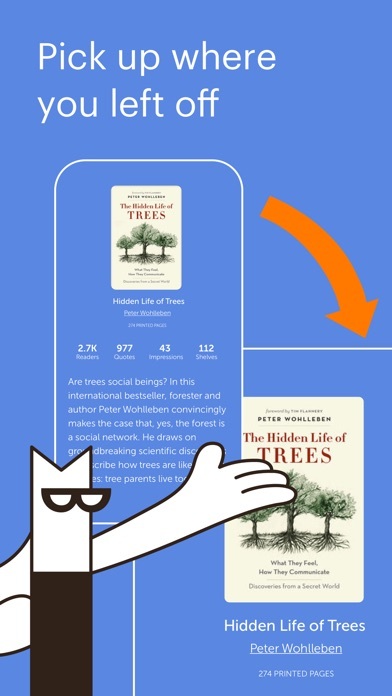 It was like a social network type thing for reading books. And I didn’t see any option to make my profile private. I cancelled the free trial. I liked the idea of being able to read anything for a monthly subscription but I didn’t want to have to do it socially and have everyone know what I am reading. The app is great and very enjoyable to use. Это, пожалуй, лучшая читалка на данный момент. Синхронизация на всех устройствах и возможность загрузки своих файлов - бесценны. I have had this app for a week and a half and already I have read more than it would cost me for three months payments. If you read more than one book a month, it pays for itself! Thanks! I LOVE IT I LOVE IT I LOVE IT!!! This is the best app ever!!! You NEED to get this app! I mean, if you read. The ONLY, onlyyy only problem with the app is that, it, sadly doesn’t show the page number, BUT! 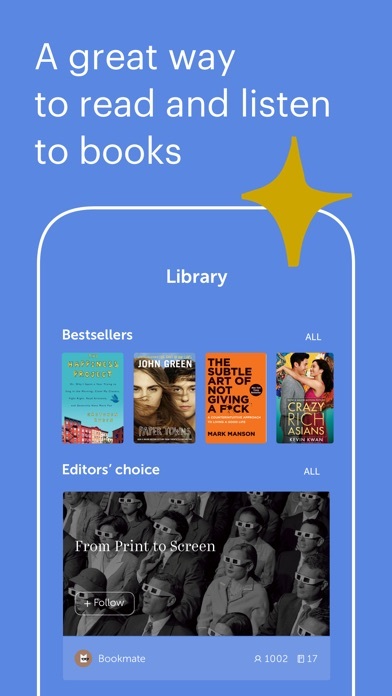 This app has like EVERY book in the world! I love this app! 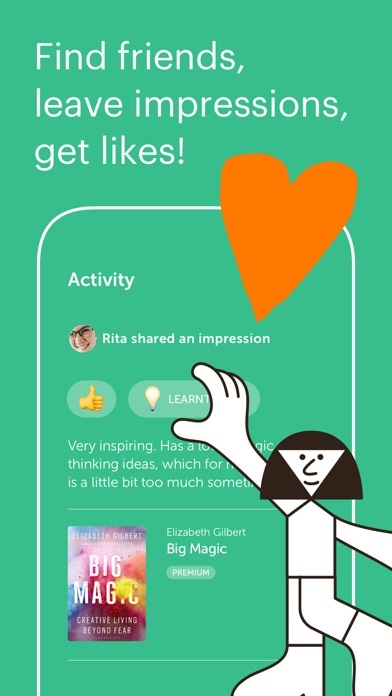 😍 When ever my daughter gives that excuse, “Mom I forgot my book!” I give her that look and hold up my phone 😂 But she really likes the app too and I TOTALLY encourage you to GET. THIS. APP. the only thing I would change is having to go back and forth to change the chapters. Muy útil y más aún si eres premium . Para los amantes a la lectura, lo recomiendo. Прекрасный выбор русской классической литературы. Es casi como andar en el bolsillo la biblioteca de Alejandría!! Not impressed with customer service. I was excited to use my free Trial. Read a book I had been dying to read for quite some time. It wouldn’t let me stop the subscription to renew after the month without stopping my free trial so I left it alone. I finished the book I wanted to read and didn’t use the app much after that. Forgot to cancel the renewal since I hadn’t been in it, which I stated to them, and when I messaged them the SAME day that it renewed, they denied me a refund since “their rules don’t allow it.” No where in their FAQs does it say anything like that at all or anywhere else that I could see. I won’t recommend this app to anyone. Might as well just go buy the books if you’re going to get charged $10 every month and their “customer service” isn’t very customer oriented. Make sure you cancel in time otherwise they won’t do jack to help you out. Great difficulty finding my library. There needs to be a menu. I thought this was free. I saw that there was a “premium” app but I did not sign up for that. It’s only when you download the app to see what the book selections Are like and how the app works, do you find out that they are going to charge you $9.99 a month. Ridiculous. Immediately I decided to cancel this app. I copied their directions on how to cancel. I could not do this on my I Phone but I will not rest until this scam is canceled. Sorry for the 1star. It really should be zero stars. AND - guess what. They tell you to enter a name for the review and whatever you try to enter for a name, they tell you it’s already taken. I just went in and gave a word, not a name and that’s taken. If you’re a quick reader this app is definitely worth it. App really need update to support iPhone X Safe Area Guides and a small enhancement: a possibility to hide bottom read progress indicator to avoid image burn out (retention) on its OLED screen. Really enjoying this service. Huge amount of available books by the modest price. The free trial was okay, they had some good books, not a bunch. But I forgot to cancel it and they charged me 10 dollars and wouldn’t give a refund. Lousy customer service. Not even worth the 10 dollars. I’ve found so many great books and I love how they suggest similar books as well. Love the app, especially because I can read in my native language as well, including classics literature. I also love that I can read offline. It’s only $10 a month and you can use audio books as well. Not a while lot of books like I bought there was going to be and I hate the lay out of some books. But it's amazing other than that. One star for throwing out a possibility to upload my own book and trying to sell me a subscription instead. What’s shame! 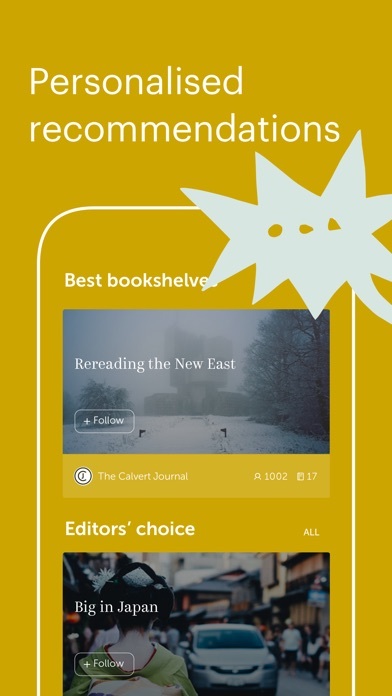 My go to book app! it’s like Apple Music but for books. Хотелось бы чтобы была возможность отключения tap zones и пользоваться только перелистыванием. И анимация книжного перелистывания страниц. The fact that you let users upload there own books is amazing. But you’re not giving us the option to choose the publishers default fonts and alignment. The way the book is intended. You only give us left alignment and justified? Also where is the default font? My requests are pretty simple really. I love the app so hope you would consider this in the future updates. I absolutely love listening to audiobooks no matter where I go but unfortunately there is not too many choices. Would love to have more Classics preferably in English and from the Russian works as well. But whatever I was able to find was absolutely great! Can't even open it. Hope you see the problem and are on it! Wish I didn’t have to pay for it after a month, but so far so good. Has some really good books and loads quickly! Great place to read the classics! I’ve downloaded more than I’ll ever have time to read, but James Joyce is so much more entertaining than Facebook. You have to pay though, it is really good. Interesting books and some are for free. I really recommend it. Только пропало очень много книг и стали уж очень дорогими. Is there a way to sync books on another device? Полюбила приложение всей душой. Особенно ценно для меня лично то, что могу читать ребенку лучшие книги на русском языке. И книга всегда со мной. Нахожу тут почти все, что хотела бы почитать. Удобный интерфейс и поиск. И очень ценно, что можно добавлять книги, которых нет в библиотеке самим. Очень рекомендую! Когда-то это было одно из моих любимых приложений и я рекомендовала его всем друзьям. Сейчас глубоко задумалась стоит ли продлевать подписку. 1. Сократилось количество книг, но об этом никто не написал. Просто появилось сообщение, что книга не доступна. 2. Приложение назойливо просит оставить отзыв, хотя я уже оставляла. Это ужасно раздражает. Служба поддержки «вежливо» отфутболила меня. 3. Последняя книга, которую там читала, была не отформатирована - оборванные слова и строки и реклама pdf граббера на каждой странице. Читать невозможно. 4. Появляется мало новинок по сравнению с тем, когда приложение только появилось. Awesome window to modern Russian booklife! I wouldn’t know how else you can dive into amazing world of modern Russian life and publishing without Bookmate.